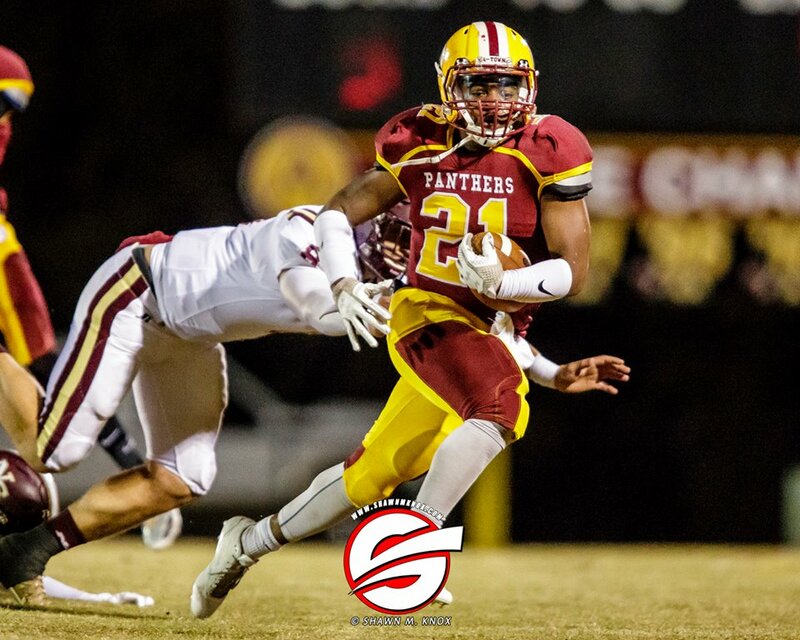 The first round of the 2A playoffs have come and gone and the Panthers took care of a pesky St. Josephs Catholic Knights squad by a score of 42-6. St Joe’s didn’t just lay down and accept their fate though. They came out swinging and in typical fashion, the Panthers had to answer the bell and establish themselves after the first couple of series. If you’ve paid attention to the ebbs and flows of the Panthers games this season you’ve noticed that the Panthers are almost like a boxer that has to get hit a couple times before he wakes up. It’s worked for them thus far, as the Panthers now sit at 10-1 on the season and are squarely in the drivers seat, determining their own fate for the rest of this season. It’s playoff time, win or go home, and the Panther’s want to keep playing awhile longer. A-Town got on the board first with a Junior Rapley 51 yard touchdown run with 10:24 to go in the first quarter. Jermaine Blackwell followed that up on the next drive with a 23 yard TD run to put the Panthers up 14-0. St. Joes responded in the 2nd quarter with a touchdown run of their own. But that was the first and last time the Knights would visit the endzone as a stingy Panther defense dug their claws in and shut out the Knights for the rest of the game. The Panthers had three different backs go over 100 yards on the night. QB Bryce Jackson had 145 yds and touchdown, Rapley had 125 yds and two scores and Dominick “The Bus” Washington had 133 yards on just 12 carries. Collectively the Panthers had 557 yards on the ground. touchdown run on the very next play. Not bad for a freshman and a sophomore. Guillebeaux’s first varsity carry resulted in his first varsity touchdown. These guys, if they remained focused and hungry, will be stars on the gridiron very soon. Defensively the Panthers saw the usual cast of characters impose their will. You also saw a first time varsity player jump off the field at you. That player is freshman #43 Luke Evans. Some people are just football players. He’s that guy. Still very young and has a lot to learn but the natural Linebacker instinct is there. He collected five tackles, five assisted tackles and one tackle for loss in limited defensive snaps and on the kickoff coverage team. Again, with focus and the time in the weight room, the upside of Mr. Evans is tremendous. The Panthers will host the #2 seed Golden Rams of Chesterfield (9-2) this coming Friday night at Hite Stadium-Dennis Botts Field. I’ll have a full round 2 game preview later in the week.